Have you ever said “sour grape”? With it you describe people who displays jealous. Many people could hear about those stories such as The Fox and the Grapes or The Tortoise and the Hare. Maybe when we were a little girl or boy, our elders cited those stories to demonstrate some great truest to us. Well, those famous stories all come from Aesop’s Fable or Aesopica. 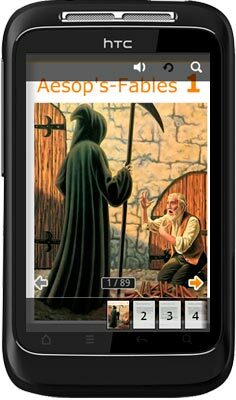 People credited the collection of fables credit to Aesop. Approximately between 620 and 560 BCE in ancient Greece, the man may be a slave and story-teller. Until now, the stories in Aesop’s Fable are also well-known throughout the world. 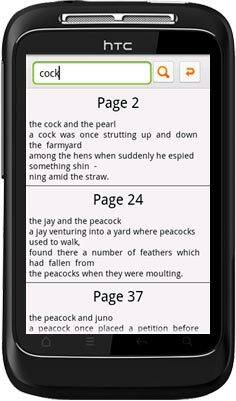 We divide the whole Aesop’s Fable into two parts, and then convert it to Android app page-flipbook. You can install it in Android system to view for free. 1. 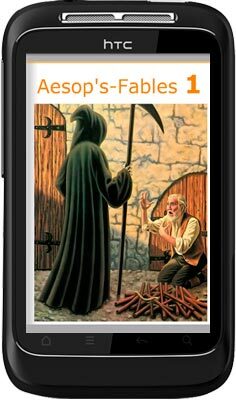 Below, you view the Aesop’s Fable 1 cover shown occupy the whole screen. 2. 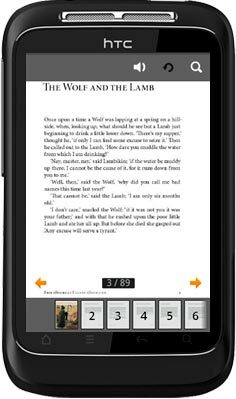 The standard interface, on top you can see the icons flip-sound (turn on/off manually), return and search, on bottom you can see all the pages’ thumbnails and previous and next buttons. 3. Below show you one of its fables. 4. When you click the top search icon, next you should step into the search interface, enter the words in searching form to search the special content you want to quick access.